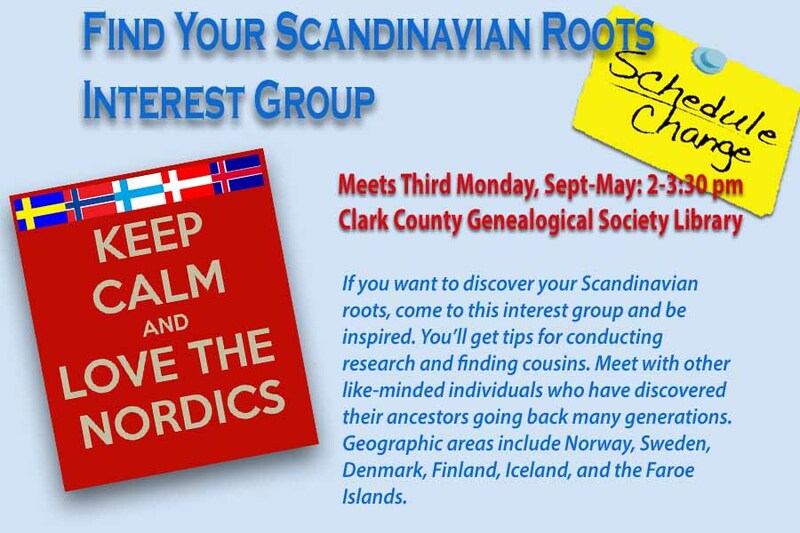 If you want to discover your Scandinavian roots, attend this monthly meeting and learn how to conduct your research. Meet with other like-minded individuals who have discovered their ancestors going back many generations. Geographic areas include Norway, Sweden, Denmark, Finland, Iceland, and the Faroe Islands. This group meets regularly on the second Thursday of the month, September-May. Members and non-members are welcome. Did you know that Germany was not a country until 1871? One must understand who controlled a given area in order to find all possible records. 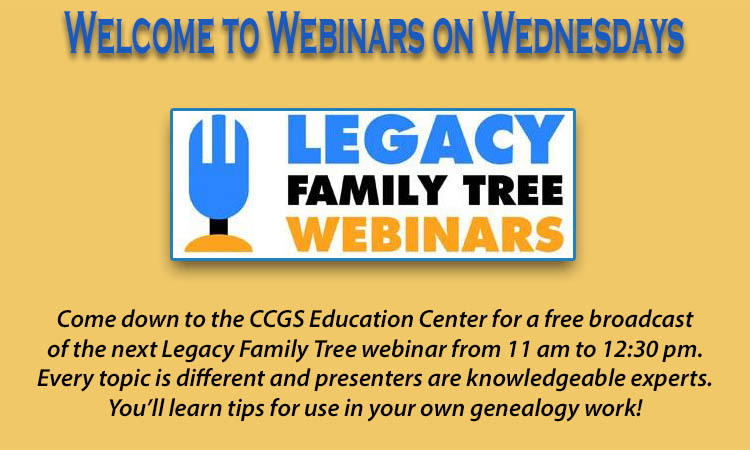 Topics included in this Legacy Family Tree Webinar are: Use of Meyer’s gazetteer, changes in historical Germanic areas, tactics for determining jurisdictions, and examples. Do you find it hard to get to the Clark County Genealogical Library during daytime hours? Come in on Third Thursday to tap into our richest resource: knowledgeable librarians who can help you with your family history search. We won’t do it for you, but we will provide guidance. One librarian has Scandinavian research expertise. The library has over 10,000 books and resources, and free access on our computers to Ancestry.com and AmericanAncestors.com. Bring your own computer and use our free wifi. 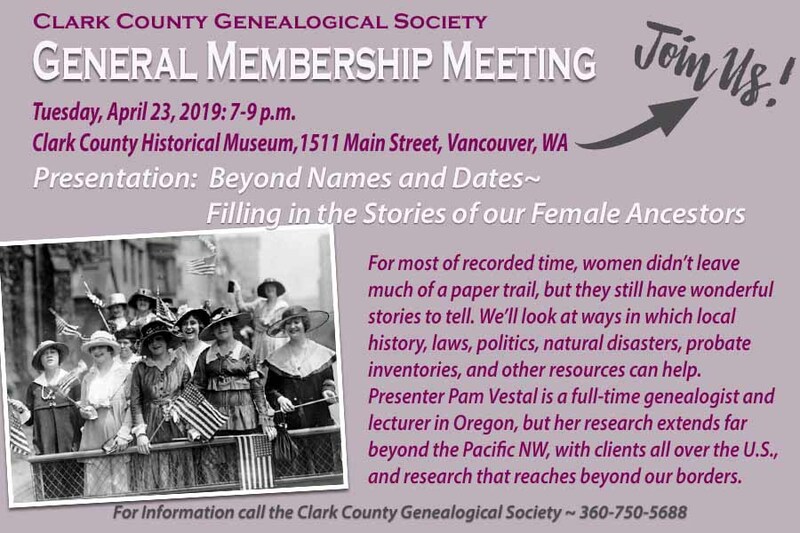 Tuesday, April 23, 2019: 7-9 p.m.
For most of recorded time, women didn’t leave much of a paper trail, but they still have wonderful stories to tell. We’ll look at ways in which local history, laws, politics, natural disasters, probate inventories, and other resources can help. Presenter Pam Vestal is a full-time genealogist and lecturer in Oregon, but her research extends far beyond the Pacific NW, with clients all over the U.S., and research that reaches beyond our borders. Should you use all or only one genealogy website for your family history goals? Learn how these genealogy giants–Ancestry.com, FamilySearch.org, Findmypast.com, MyHeritage.com–compare in 2019 for historical records, online trees, DNA tools and access options. This Legacy Family Tree Webinar will review each site’s strengths and weaknesses that will help you know which to use now, and which to keep in mind when your research interests or budget change. This entry was posted in Society News and tagged Clark County Genealogical Society.